Our March Hui-a-Iwi started at Umupuia Marae. Although we only had a small group everyone was excited to be able to visit some very significant sites to Ngai Tai. From Umupuia we went straight to the Wairoa river in Clevedon and listened to a korero about its illustrious history as a significant port for Aucklands trading industry. From the Wairoa we travelled through the Ness Valley and headed up to the Hunua Falls. 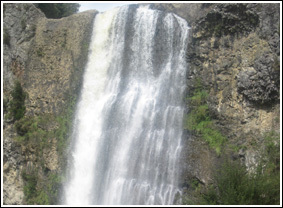 The Hunua Falls are located in the Hunua Ranges and as expected are absolutely beautiful. This is one of the many domains of the Patupaiarehe. 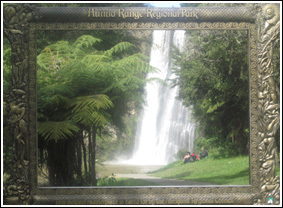 The Hunua Ranges are also home to a wide range of indigenous wildlife species. This visit was an ideal opportunity to stroll around the area directly around the pool. Just before lunch a handful of us took time to go in for a very chilly dip at the bottom of the falls. Although it was very cold the swim seemed to cleanse our body and our spirit. We all shared a lovely lunch together before heading out on the road again. We visited several other sites before we all headed back to our own whanau. It was a great day for reflection and a good opportunity to visit and walk some of these sacred sites of Ngai Tai.